There’s a little girl in our neighborhood. She’s beautiful, and precious, and precocious, and she comes from a background my boys find very difficult to understand. For some reason, she latched on to my boys. Maybe it was because they’re so handsome (at least mama thinks so), or maybe it’s because they just listened to her story. Regardless, they were her safe place. In the midst of her struggles and trials, they loved her, and wanted her to know Jesus, and this blessed my mama’s heart like nothing else could. But I slowly began to realize that their tactics for sharing the gospel needed some finesse. Several times, as I watched them play through my front window, I noticed them huddled together, talking deeply about this or that. And like a flash of lightening, she would get up and run away. After some prodding, I realized my boys were cornering her on her faith. Pressing her for details to prove she was a Christian. Over the breakfast table, we dissected their approach (this is a slightly abbreviated version of the conversation, but you’ll get the main points). Mom: “I’m so glad you want her to know Jesus so badly! I do, too…But boys, tell me about the way you behave when you’re playing together with her. Do you fight, argue, and bicker with each other?” (Of course, mama already knew the answer…). As we continued, it became clear that a lot of time was spent arguing over who was right, who got to go first, who got their own way, and who was best. And as I listened to them defend themselves around the table, blaming each other for not playing fair, being selfish, or showing off, a light went off in my heart, and I knew what was happening. In light of Friday’s Supreme Court decision on gay marriage, we felt like you might be trying to figure out how in the world to begin having these conversations with your children. As my friend Amanda said, this seems to be THE issue of our generation, and friends, my boys are old enough now that I have to begin having these conversations with them. They notice the two men holding hands at the mall. They read billboards. They see the news. We can’t hide under a blanket, wishing things were different. We have to find ways to live in the world we live in, being the hands and feet of Christ the whole time. But how do we do that as it concerns this issue? Any issue that differs from our beliefs? 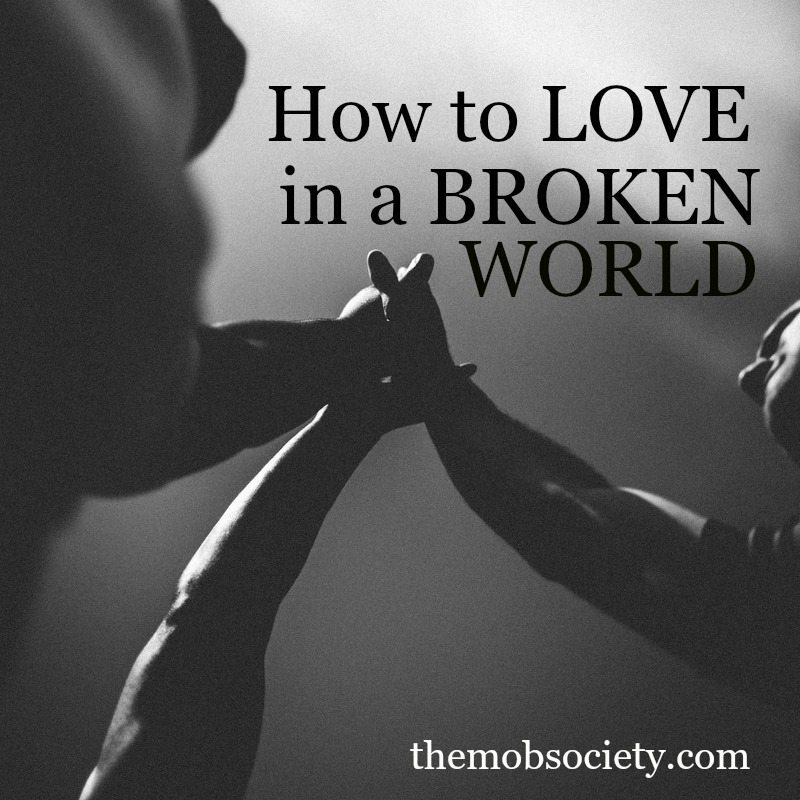 How do we love in a broken world? Let me start by saying that my boys got it wrong. While their friend wasn’t gay, and didn’t (as far as I know) come from a gay family (really, her story has nothing to do with the gay marriage issue), the way they interacted with her is a perfect illustration of everything we’re doing wrong as a culture, and a call to do it right. 1. We must love others more than we love ourselves. Woven into the conversations on social media about yesterday’s rulings is a thread of, “well, what about me?” Christians are starting to talk about their right to have their own opinion, and how the world is increasingly doing to us what we’re no longer allowed to do to others. They’re hushing us, taking away our rights in favor of giving rights to others. We can barely say the word “gay” and “God” in the same sentence without being accused of hate. It’s frustrating, but I don’t see it as a problem. We’ve been broken from the beginning…we’ve just been very sheltered from it in America. The freedom we’ve experienced as American Christians has been wonderful, but it isn’t what God promised. Quite the opposite. Jesus promised us that “in this world we will have trouble…” He promised us trials and tribulations, and challenged us to “count them all joy” because it meant we were getting to sacrifice our lives for the one who sacrificed his for us. American Christians are getting a taste of what Christians in the rest of the world have been experiencing for years. Our season of comfort is coming to a close, and it’s OK because Jesus said it would happen. We have to stop worrying about our rights, our privileges, our comforts, and truly begin loving others into the Kingdom. 2. I knew what yesterday’s ruling would be before it ever happened, but that’s not the point. Legislation has turned away from the favor of Christians. Maybe a different government would’ve prevented it, I don’t know. I’m not an expert on government proceedings. But I knew what was going to happen yesterday, and as much as I wish our country did a better job of honoring God in every way, I don’t think the ruling was the main point. The main point is this: God has called us to make disciples of all people, and the way we do that is by being true disciples ourselves. We can have all the knowledge of the Gospel, and know 100 different ways to share it, but unless we are living it no one will believe us. Yesterday’s ruling, more than anything else, is a call to embrace Christ, live Christ, and love like Christ. 3. There must be something different about Christians. No matter who we’re trying to reach, we have to do it through our lives. I’m afraid we’ve fully entered into a time when words won’t matter, because we’ve used words, God’s words, to shame, and try to justify our prejudices and judgements. We’ve used them to hurt, and not heal, and how we treat people is more important than what we say. 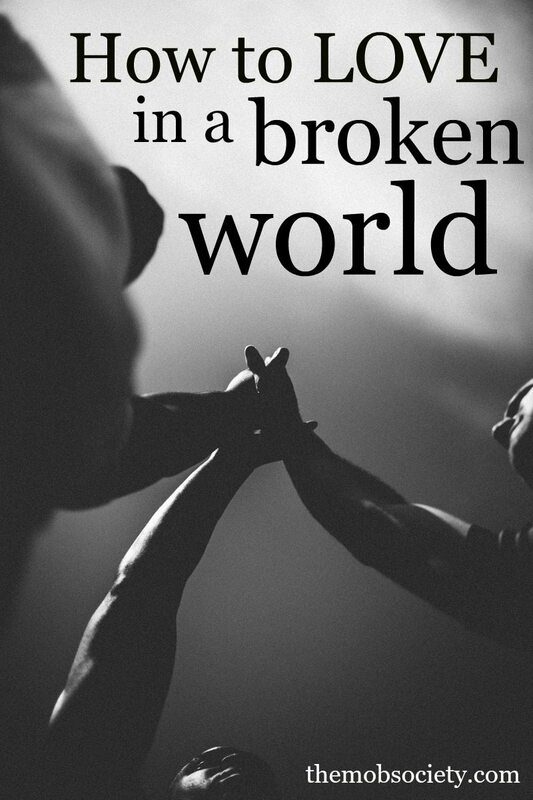 What my boys did wrong, as they tried to reach their friend for Christ, was act just like the rest of the world. Their bickering, and arguing, and fighting amongst themselves showed her they were no different from anyone else. They professed to be Christians, but when pressed, acted like the world. Now is the time for us to decide whose side we’re on, and I’m not talking about whether you believe homesexual marriage is ok, or not. I’m talking about radical, sold out loving Jesus. Moment-by-moment pursuit of him. Sacrifice for the sake of others, living so that others see we have something they don’t…hope. We have the only true hope. 4. You might be wondering what all of this has to do with talking to your children about what has happened in our country. I’m not going to rush into deep theological, political conversations with my children because of what happened yesterday. Those conversations will come naturally, as they arise, and we won’t shrink away from them when they do. The Bible will stand in our home, and lead these conversations because we believe it’s true no matter how we feel about what it says. Until that time, I’m asking God to give me and my husband strength to love others more than we love ourselves, to live as Christ, and be willing to sacrifice ourselves so that others can know. My prayer (God help us) is for the world to see we have something they desperately need because there’s something different about us. My children are watching everything I do. Yours are watching you. If they’re going to learn how to live like Christ in a world of darkness, they’ll look to us to teach them how. Actions speak louder than words. Live what you want your children to believe. As St. Francis of Assisi is credited as saying, “Preach the Gospel at all times. If necessary, use words. 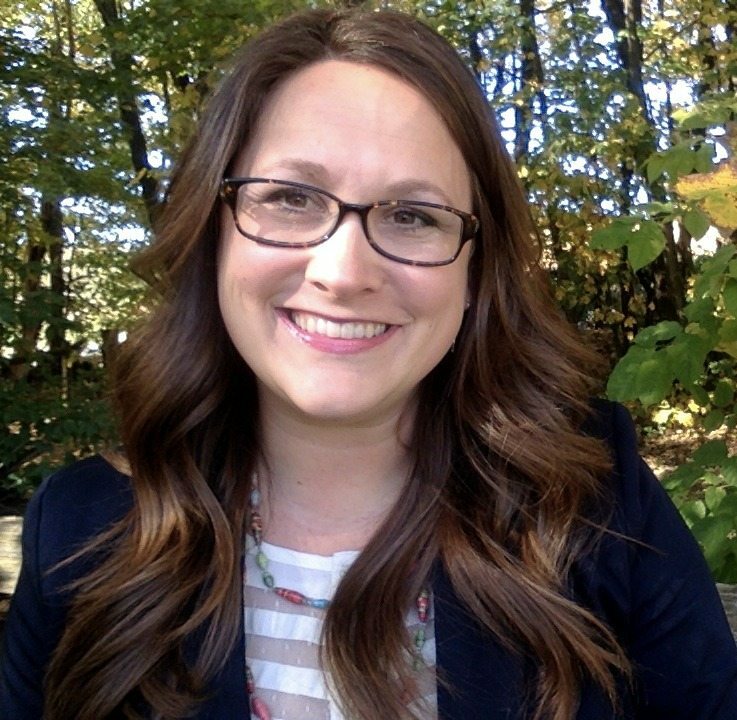 Brooke McGlothlin is co-founder and President of Raising Boys Ministries. She’s a mother of two boys who believes God has chosen her to fight for the hearts of her sons. She can be found most often on her knees in prayer, not because she’s so holy, but because God is. Not because she knows how to raise godly men, but because she believes so much in the God who loves them more than she does. To stay connected with Brooke, sign up for her free 5-day prayer challenge for mothers of boys! Sadly it’s not biblical. In fact I think it’s said to let people off the hook. We are commanded to proclaim the gospel, we use words, not only actions, it’s both and, not either or. Thank you so much for posting this. I am so torn right now.. with how to honor the Gospel and God’s word but also speak the truth in love… how to raise boys in this society… how to model Christ’s love while acknowledging the Bible as the only truth. I needed your words and am so grateful for your faithfulness. Love this! Thanks! It’s so hard to navigate the muddy waters that our world is. Thank you for this thoughtful message. IMHO, it’s spot on. I do hear what others are saying about speaking the gospel. But as your boys (and honestly, most of us) discovered, our actions do speak louder than our words. So, if we act out our Christianity by reflecting Jesus into the world, people are going to be curious. Opportunities for words will open up, and those words will fall on listening ears and open hearts because of our actions.